After months of investigation, Korean Tech Giant Samsung now knows exactly why all those poor Galaxy Note7 phablets exploded last year. For the first batch of units, Samsung shares that a design flaw in the upper right corner of the battery pack made the electrodes prone to bending and this even led to a breakdown in the separation between positive and negative tabs, causing it to short circuit in some cases. As shown in the diagram above (prepared by CNET), the procedure includes an X-Ray Test to check for abnormalities in design, Accelerated Usage Test that simulates how to battery will react when pushed to its limits, as well as Durability which will include puncturing, overcharging, and exposure to extreme temperatures. 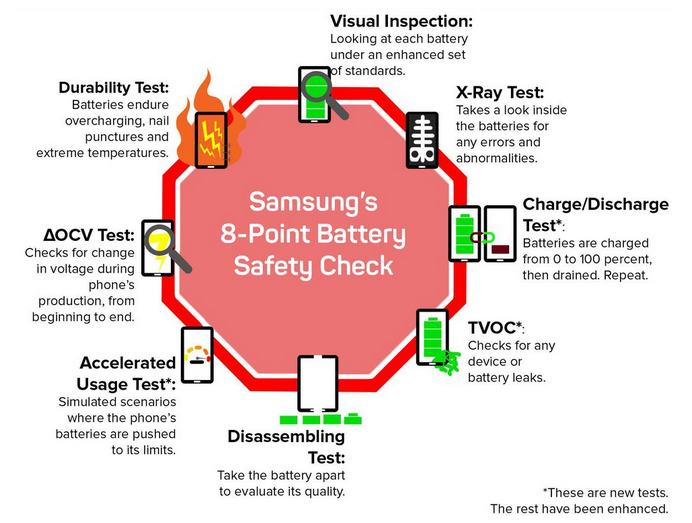 Samsung hopes that these positive changes in its own manufacturing process would result to an industry-wide improvement in battery safety design and inspection. To quote Mr. DJ Koh - Samsung's Mobile Business Head, "If we contribute this as a global standard, then I strongly believe that will definitely increase the lithium-ion battery safety. For customers, we have to develop innovation, but customer safety is the priority. In the end, we can win the customers' trust back." Great job, Samsung! I think this giant leap towards recovery is very inspiring. Like what I always say, everyone makes mistakes -- but it is what you do after you make a mistake that will show what you true character is.